The Hill Cottage Bed and Breakfast, near Stratford-upon-Avon, is set in an outstanding, elevated position enjoying glorious views across orchards and golf course to the distant hills. 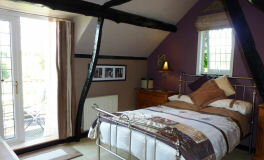 For those seeking a Bed and Breakfast of immense character, The Hill Cottage B & B will not disappoint! With locally-sourced, freshly-cooked breakfasts served in the Dining Room, and individually decorated bedrooms and relaxing areas, our aim is to provide every comfort and opportunity for our guests to really unwind, whether they are with us for a single night, a long weekend break or an extended stay. A stone’s throw from The Cotswolds, we are centrally placed for exploring the wonderful Warwickshire countryside; many National Trust Properties; Gardens; Museums; historic towns, even NEC exhibitions. Looking for a present? Please ask about our Gift Certificates. Many of our Stratford-upon-Avon bed and breakfast guests have enjoyed their stay with us over the years, which is why we are so highly rated on TripAdvisor. Read our reviews, or if you have recently stayed with us write a review and tell us what you thought. Set on a hill near Stratford-upon-Avon, overlooking wonderful Warwickshire countryside, The Hill Cottage has enjoyed this position since the early 1800’s and has been extended over the years to provide the extensive and characterful house you see today. Guests are welcome to relax in the attractive and comfortable Sun Room, enjoying views across the orchards and golf course, or to explore the extensive grounds. We offer Double, Twin and Single bedrooms, En-suite and Private Bathrooms, and Balconies, each room individually furnished to the highest standards of comfort and providing all you would expect from a recommended establishment of excellent reputation. Freeview television, refreshment tray, hairdryer, free wi-fi access etc. as standard. 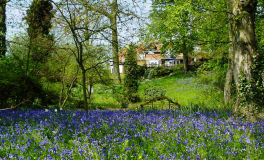 The one and a half acre gardens are a particular delight of The Hill Cottage, and include a bluebell wood. You could plan a ‘romantic break’ towards the end of April/early May to see the bluebells at their best. Their evening perfume is intoxicating; Whatever the time of year, there is always something of interest and a variety of places to sit and ponder, in sun or shade. We are Top Rated on TripAdvisor and have been featured in the Good Hotel Guide. Our prices range from £35 – £50 per person per night. 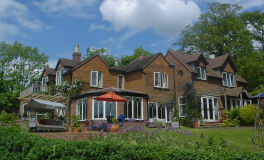 The Hill Cotttage B&B is located in Snitterfield, near Stratford upon Avon.